Home Inspection, Radon, Termite and More! Here’s a good tip. 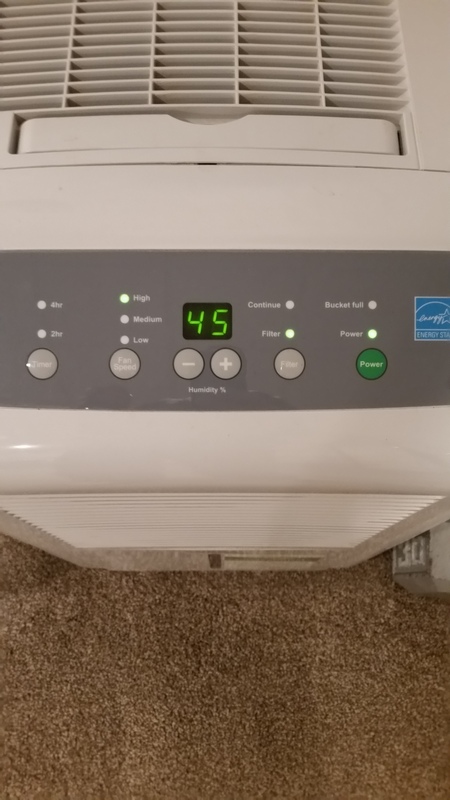 During the transition between warmer and colder outside temperatures , turn your furnace fan switch to the on position and set your dehumidifier down to around 45%. This will help reduce interior moisture levels, which will reduce condensation on windows and the potential for mold growth. You may have to do this more than once per year depending on the weather and whether or not you are experiencing excess moisture on your windows. Check out this post to learn how to make window maintenance easier during this time of year. Early in the winter we are constantly battling excess moisture in the home. The excess moisture comes from cooking, breathing, bathing among other sources. When the warm moist air comes into contact with cold surfaces, the air cools and moisture condenses out onto whatever surface it comes into contact with. Using the furnace fan and dehumidifier can help reduce interior moisture. Simply follow the steps above and eventually the interior moisture levels will drop enough that the dehumidifier will not run any longer. During the rest of the winter months, the humidity often drops so low, that you may experience dry skin, dry nose, and excess static electricity. The humidity can get as low as 10% at times. That is dryer than the driest desert. In order to combat this, many people have humidifiers either permanently mounted to their HVAC system or portable units that require refilling. When setting the humidity levels on humidifiers we need to try to keep things reasonable. You can’t expect to have 70% in the middle of January when it’s 10 degrees outside. A reasonable, or comfortable level of humidity in the home during the winter would be around 30%. You simply set the humidistat and the unit will do all the work or you. Most find that between 30% and 40% is a good interior moisture level during the winter. I suggest keeping it at the low end if you can to avoid condensation. During the summer months I always recommend that you set your dehumidifier to 55% or 60% and forget it. This is a reasonable level for the summer months and will keep mold growth at bay. It will also help with utility bills as the unit will be able to cycle on and off as opposed to running constantly when the level is set too low. High interior moisture levels are the enemy of comfort and good health year round, so keep it under control. Iowa Home Inspection: Who built this thing? Iowa Home Inspections: Cedar Rapids, Cedar Falls, Iowa City, Marion, Waterloo, Waverly, Manchester, Independence, Oelwein, Anamosa, Mt Vernon, North Liberty, and Coralville.